If I remember correctly last fall during the Fast Laps was the last time. So it has be and easy 6 months since I was on the mountain bike. I looked up my off road miles from last year and I had less than 100 miles total for 2011 (and over 1/2 of that was in one shot at the 6 hour race at John Bryan). Last year I got a whopping 4 miles in at MoMBA with Freddy. So going there yesterday was a little scary. What was I getting into... I knew from previous years I was able to ride the place. But it has been forever. I couldn't tell you what trails turn into other trails... and typically I have no idea where I am out there. Which adds to the stress. I usually have to know where I am. Anyways - the Fast Laps series this year started differently. Each category was a group start with 2 minutes between each class. So this year I could not race my Clydesdale's class... first time ever. I chose to run Masters (40 years old and older). Finally - take advantage of my age. I lined up with 5 other riders in Masters. We took off down a double track (kind of like a fire road) for about 3/4 of a mile. It spread the field out. One guy struggled to pass me at the last minute before going into the woods, and then once in the woods I had to pass him back. But with the new tires on my bike and brake pads... I should have pre-road the bike a little more before jumping into the first race. Anyways it took about 1/2 the race before I was feeling comfortable on the bike again, trusting its movement. I ran off course once where someone ripped the tape down in a corner, luckily I saw it and didn't loose too much time here. Then later, someone was yelling behind me, I thought they wanted to pass and as it turns out after the fact, they were yelling at their Dad - who was behind him and he was beating. But I turned to look to see if he was going to pass or keep yelling and I wrecked...... smooth. Anyways I finished in 4th place. First place was about 3 minutes ahead of me. I totally think I can do this. 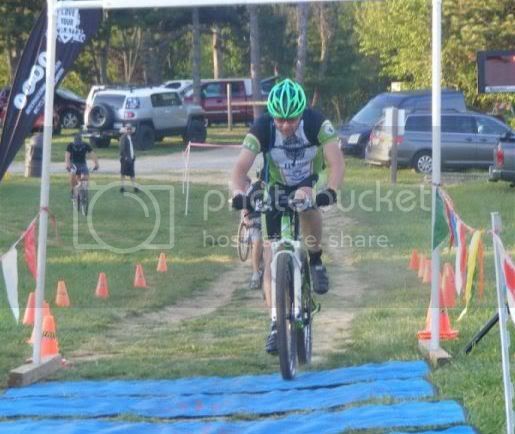 I did notice at the end of the race - on the flats and hills I was closing gaps. I was having trouble on anything downhill (where I used to fly, but being off the bike too long has taken it away from me). So if I can ride one more time, stay on course, and not wreck... I think I am a contender. This is my new focus... and I am determined to do it. So who wants to go ride?